While you are sleeping, robots work tirelessly on other planets, digging, probing, analyzing, searching; painting an ever more detailed picture of worlds beyond our own that have intrigued us for centuries. 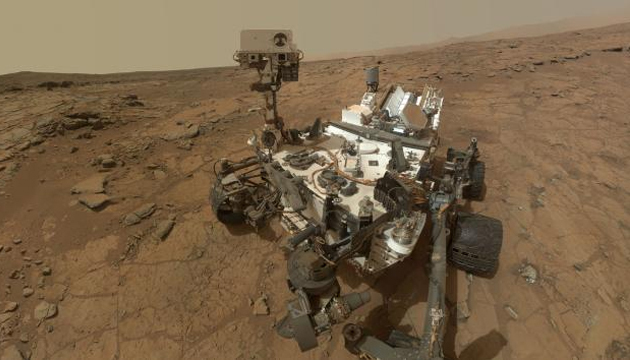 Close to home, NASA's Curiosity rover on Mars, sniffing the cold, thin air as it crawls ever closer to the foot of Mount Sharp, has raised eyebrows by something it has not detected: methane. And much farther out the Cassini spacecraft has made a positive detection … of plastic, in the atmosphere of Saturn's moon Titan. Why is finding a lack of methane on Mars surprising? Because previously we thought we had detected it. Earlier observations made from Earth and from spacecraft orbiting Mars indicated the possible presence of this hydrocarbon. That was an exciting result, since methane, which most of us are familiar with as the gas that flows out of gas stoves, is formed in large quantities on Earth by living organisms, from microbes all the way up to large animals, like cows. Might methane in Mars' atmosphere mean there is life on Mars, today? Most of our missions to Mars have focused on the question of whether the environment on Mars in the past was suitable to support life, so the detection of a possible indicator of life there today created quite a buzz. But Curiosity, a complex and self-contained roving chemistry and geology laboratory, has ground-truthed that rumor, telling us that if there is methane on Mars, its abundance falls below Curiosity's considerable ability to detect it. This does not kill off the possibility of life existing on Mars today. There are plenty of examples of life forms on Earth whose metabolic processes do not produce methane. It does, however, move the subject back into the camp of "no evidence yet found." Shifting to the Cassini spacecraft in the Saturn system, what does the detection of plastic—or a constituent thereof, propylene—say about the moon Titan? Propylene is the building block molecule of polypropylene, a plastic that surrounds us (for better or for worse) in our daily lives. This, along with the hydrocarbon "smog" that Titan's thick, hazy atmosphere has become famous for, might conjure up images of a world inundated with the pollution of an industrial society that never got its recycling and clean energy programs up to speed—completely unlike our civilization, of course. Titan's atmosphere, which is considerably thicker than Earth's, is mostly nitrogen, but loaded heavily with hydrocarbons like methane, ethane, propane—and now propylene. It's a brew of organic compounds, complete with global wind circulation and a liquid cycle that resembles the water cycle on Earth, including precipitation, river networks, and large surface lakes—although of liquid hydrocarbons like methane and ethane, not water. Though the environment on Titan is cold in the extreme, these weather cycles and the rich broth of hydrocarbon molecules churning within them raises the exciting possibility of even more complex organic chemistry taking place there. Add to all of this the likely existence of a deep, subsurface ocean of liquid water far below Titan's surface, and one's imagination can really start getting out of control. Life on Mars or on Titan? We don't know. Organic molecules and chemistry don't mean life, just the chemical foundations of life as we know it on Earth. Nor does the apparent lack of an indicator like methane mean an absence of life. What it all means, on Mars, Titan, and other worlds out there, is that we have a lot more sniffing to do.